Nicalis is celebrating its 10th anniversary, and coincidentally or not, is also releasing 10 games in 2018. That's a big milestone; what was once a small self-publishing operation is now a bustling mid-sized publisher with a certain notoriety for quirky, self-aware indies and goodie-filled physical releases. Nicalis president and founder Tyrone Rodriguez is rightfully proud looking back at the company's accomplishments over ten years. For him, "self-publishing was the next logical step" after a varied career across multiple facets of the industry, including writing for magazines, product development, PR and marketing, and working with Nintendo during the launch of the Wii. The move to create Nicalis began with Dance Dance Revolution: Mobius, Cave Story followed a few years later, and the operation quickly expanded to publishing titles by other developers, too. "No matter how much experience you have... it really is impossible to know which games are going to become hits and which ones will just be footnotes"
"As we developed and co-developed more games, we continued to discover fun projects that were made by teams or individuals who needed help: a console port, marketing assistance, programming support, or funding," Rodriguez said. "There was no specific business plan to expand in that direction because the industry was heavily in flux when we established the company. It just grew organically as our expertise expanded." Nicalis grew rapidly, gaining notoriety and clout from milestones such as its recognition (as Rodriguez put it) as a "real" developer by Sony and Nintendo when the companies trusted the Nicalis team with prototype hardware and dev kits. The Binding of Isaac: Rebirth was another major release that helped bolster Nicalis, as was the company's recent partnership with Tezuka Productions to bring Atom and Black Jack to its upcoming, in-house developed mascot puzzler Crystal Crisis. Throughout the discussion, Rodriguez brought up multiple times that his decisions for what to create and publish stem from his own interests and desires and what the teams involved thought was exciting, rather than a particular kind of business sense. "No matter how much experience you have, how good your business instincts are, or how hard you try, it really is impossible to know which games are going to become hits and which ones will just be footnotes," he said. "I think my hunches are better than most, but I'm often surprised by what catches on. My personal preference is for games that are well-designed, polished and fun to play, with kind of a retro aesthetic, and there seem to be a lot of people who feel the same way." But a healthy understanding of how the industry works is still vital for a different part of the process, Rodriguez added. "Marketing and PR are the most overlooked and ignored part of the business from game developers and publishers alike. Creating some kind of relationship with your players and fans is more important than ever. And the little details that take the most effort and time are often the things that make a good game a great one." 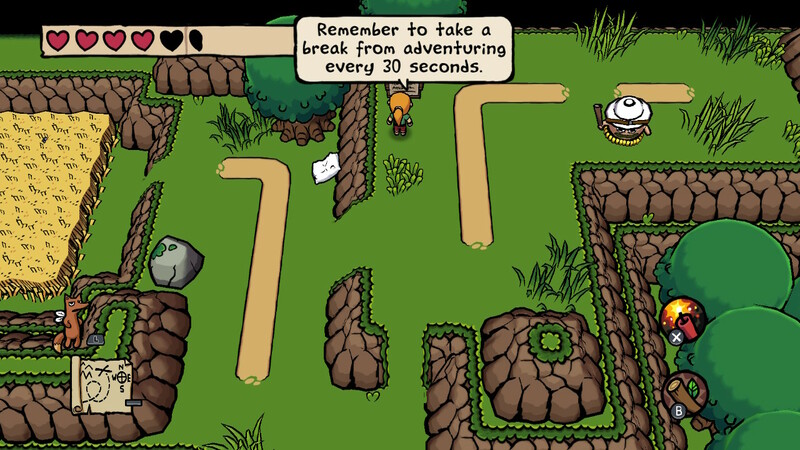 "There's still an audience out there that loves the nostalgic experience of opening up a game"
Nicalis took that attention to "little details" a step further than most publishers. 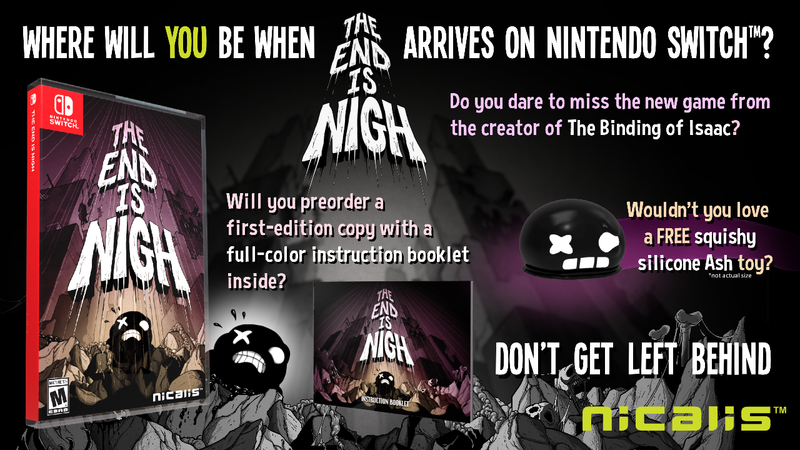 In recent years, Nicalis-published physical releases - such as The End is Nigh, Ittle Dew 2+, and Wonder Boy: The Dragon's Trap - have often included in-box goodies like maps, soundtracks, tiny figurines and, in a very classic throwback, full-color instruction manuals. Many of these have released on the Nintendo Switch, which adds an additional level of nostalgia to those who fondly remember old Nintendo instruction manuals packed into cases with an extra trinket thrown in like a cereal box prize. "It was just a desire to take things back to the way they were in the late '80s and early '90s," Rodriguez answered when asked why Nicalis revived this long-since abandoned tradition. "I loved buying games with maps or stickers and stuff like that inside the package. People used to joke about not reading the instruction manuals and other materials that were included with games, but as it turned out we all really missed those bonuses when they went away." When I asked if these physical releases had proved lucrative, Rodriguez's answer was focused entirely on developers and players. He said these releases were beneficial for the studios Nicalis works with because of the very different audience attracted by an enticing physical edition. "It's good exposure for the games and for the developers we're working with," he said. "When you can walk into a Wal-Mart, Target, Best Buy or GameStop and find your game on the shelves. Many times it's an entirely different type of player entering the store, picking it up and walking out with your game. It has also generated a lot of goodwill with fans. People are always telling us how much they prefer physical copies of their games, and how much they appreciate the bonus goodies inside the case. "The decisions we make are typically based on what we think is cool and what we think fans and players will like, too"
"There's still an audience out there that loves the nostalgic experience of opening up a game, smelling the manual and playing a physical copy on their console of choice, or proudly displaying it on the shelf with their other physical games." Despite the extra value, most Nicalis physical releases remain cheaper than full-price games, and this is in a world where games with extras often turn into a more expensive "Collector's Edition". But once again, Rodriguez emphasized that what other companies might see as a very business- or profit-oriented decision is, for Nicalis, more about what they believe will make the release more exciting. "I don't know what could be stopping other companies from doing it. Maybe they think it's too costly or they just don't want to put in the extra effort. It's probably a combination of both, they're probably just being lazy and cheap. If this strategy has created a niche for us, it's because the decisions we make are typically based on what we think is cool and what we think fans and players will like, too - not what it looks like for just business." With ten years of largely successful games under its belt, an in-house developed title on the way, and a new notoriety for a kind of physical release no other company is doing, Nicalis seems well-positioned to keep growing. Rodriguez was optimistic about the idea of one day becoming a "major publisher," but with a caveat: "As long as it's still fun and we're still making people happy with games that matter." "When we talk about growth, it's really more about doing bigger things, making better games and growing our fanbase - they're why we're here," he continued. "Expanding our marketing efforts, finding ways to get better at talking directly to players, that sort of thing. Working more closely with our development partners. It's not necessarily about expanding the workforce or the office space, or releasing more games than we did last year. We're more interested in quality over quantity."